A collection of the first three books in this New York Times bestselling series. Hang out with Jack Sullivan and his friends as they navigate life after the Monster Apocalypse--living in a tricked-out tree house, avoiding zombies, battling evil world-destroying monsters, and generally treating life like it's the best video game ever! 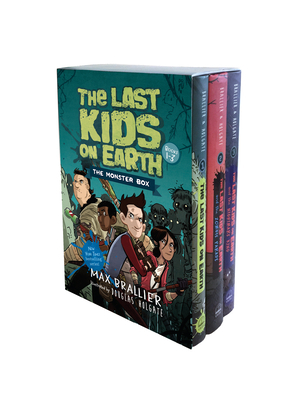 This boxed set includes the first three books from the New York Times bestselling The Last Kids on Earth series: The Last Kids on Earth, The Last Kids on Earth and the Zombie Parade, and The Last Kids on Earth and the Nightmare King. Full of black-and-white illustrations, cool inventions, and every sort of monster, The Last Kids on Earth Collection is the perfect gift for the kid who doesn't want the action (or the laughs) to stop! Max Brallier (maxbrallier.com) is the New York Times bestselling author of more than thirty books and games, including the previous books in The Last Kids on Earth series. He is the creator and writer of Galactic Hot Dogs, an ongoing middle-grade web serial and book series with Aladdin. He writes for licensed properties including Adventure Time, Regular Show, and Uncle Grandpa. Under the pen name Jack Chabert, he is the creator and author of the Eerie Elementary series for Scholastic Books. In the olden days, he worked in the marketing department at St. Martin's Press. Max lives just outside of New York City with his wife and daughter. Douglas Holgate has been a freelance comic book artist and illustrator based in Melbourne, Australia, for more than ten years. He's illustrated books for publishers including HarperCollins, Penguin Random House, Hachette, and Simon & Schuster, and comics for Image, Dynamite, Abrams, and Penguin Random House.